This is the first Sherlock Holmes novel, which introduces us to the great detective through the eyes of his companion Dr. John Watson. 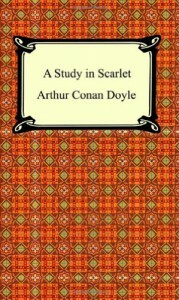 The story follows the two men from their first meeting to Watson seeing firsthand Holmes' deductive skills in action. The beginning an the end of the story are really enjoyable as we get to see Holmes working to solve the case and there's quite a bit of humour in Watson's observations of Holmes. The chapters in the middle of the book comprise of a flashback that explains the motivations of the criminal but it is neither exciting nor engaging. Overall a good book with a somewhat weird story structure, and a nice introduction to Sherlock Holmes.